“Even when covered by a major health insurance company in the San Francisco Bay Area—the epicenter of cutting-edge trans* healthcare—it was difficult for Kelly Lewis to find competent care. “The doctor told me he didn’t feel comfortable prescribing shots, so he wanted to start me on the patches,” Lewis was told by a doctor when seeking testosterone hormones. “I felt that this physician was more of a gatekeeper than a provider,” he continued. After requesting to change doctors, Lewis was asked by the office to stay because the doctor wanted to learn about transgender healthcare—on his body. 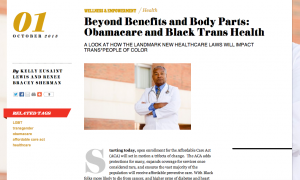 While the provider’s intent to learn more about trans* health care appeared noble, no one should have to be treated as an experiment especially given the sordid history of experimentation on Black bodies in this country. The lack of education among providers and the ongoing stigma facing Black trans* people factor prominently in health disparities in the Black trans* community—the ACA does not specifically address healthcare discrimination based on gender identity or expression,** which is a prevalent experience.